Never tried yoga or want to get back to the basics? This class is for you! Join us for a fun, light-hearted class focused on cultivating a strong foundation on which to build your yoga practice. With student-focused, individual attention, this class is an ongoing study of basic alignment, breathing and breath directed movements, and cultivating mindful awareness. Classes are taught in an open style which includes flowing sequencing, focused work on specific postures and answering questions along the way. No experience necessary. All props provided. For more information check out our Getting Started page for everything you will need to know about your first visit to our studio. our understanding of the Self. Subtle channels open, and begin to flow freely with vital life force energy, and we recognize our experience as a reflection of the greater rhythms and Flow of life and the universe. Hatha Flow is designed to support all levels of students in their practice. Props and modifications are offered to invite students to find their optimal posture with increased ease and gentleness. These classes incorporate restorative and/or therapeutic postures, longer holds in a smaller number of postures, and guiding movement with the breath. We practice the postures in ways to support our body's natural desire to be balanced. The instructors will support you in finding your ideal alignment. The practice closes with a deeply calming final relaxation (shavasana). Open to all students. Wake up with the SUN. Energize your mind, body and spirit in this one-hour class that calms the mind and invigorates your entire day. We face the rising sun, flow through the body prayer of sun salutations to honor and celebrate the ultimate source of all life. Using music to inspire, meditation to calm the mind; and smooth, conscious, breath directed movements to anchor the awareness, the practitioner is led from one pose into the next. This is an alignment based Flow class open to all levels. Core Flow is a fun, high-energy class of asana and strength building with the focus on building core muscular energy, emotional energy, and stamina. Having a stronger core creates the direct benefit of vital muscular energy, but it also builds your emotional strength, and helps to balance out tension in the areas of the hips and lower back. With a strong core you will have a much safer and more energized practice on the mat, as well as build energy to face the daily practice of life off the mat. The class is open to all levels of students. This class is designed for runners, but is appropriate for students of all levels who want to develop flexibility and strength. Repetitive sports like running can exacerbate imbalances in the body and shorten muscles. Yoga offers a way to identify weak or tight areas and balance them with breath awareness to focus the mind. The class focuses on developing strength, balance, and flexibility. Core, hips, hamstrings, calves, and feet will get special attention. Yoga complements any sport, helping to prevent or recover from injuries. Come expecting a yoga class that incorporates asanas (poses) and repetitive motions to build strength and flexibility in a safe, light atmosphere. Open to all. No previous yoga experience required. Prostrations are an ancient form of yoga that integrates body, breath and intention. They are a foundational practice of Tantra that can dissolve tension, negative emotions and limiting self-concepts. The practice is performed in a state of presence, combining aspects of Suryanamaskar (sun salutes) into one continuous fluid motion. Each class will start with an explanation of the practice- the visualization and how it is performed, including less strenuous options. Traditionally the full practice consists of 108 prostrations with an integration period (meditation, shavasana) to follow. Prostrations are a wonderful purification practice that works off negative karma and benefits the body (intense core work! ), mind and spirit. All levels welcome. Rejuvenate your mind and rehabilitate your body with a fusion of active release, yoga, and foam rolling. We utilize props and massage techniques to increase mobility and strengthen body awareness. All levels welcome. Newbies encouraged. Restorative Yoga is an excellent practice for restoring the body after over working, injury, illness or simply to slow down and undo the effects of stress. 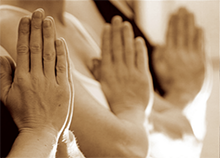 This class is gentle and slow with sequences that allows the body to open at its own pace. The body is supported by props such as bolsters, blankets, block and straps, so that postures are held without effort or force. The body moves toward a natural state of balance and relaxation. Students leave the class feeling deeply rejuvenated and refreshed. Open to all students at any level.